The Weight of a Good Book: a Meme! | Delicious! Delicious! The Weight of a Good Book: a Meme! Caryn stumbles through the door with her over-sized suitcase and a few other very heavy bags. She drops everything in the center of the room and looks around. It could be a hotel room in any place in America. At least we’re not in Mississippi anymore, Toto. She plops down beside her big suitcase and unzips it. Shoving the clothes aside, she reveals that the bottom of the suitcase is full of books. She takes them out one at a time: The Gourmet Cookbook, Zingerman’s Guide to Good Eating, The New Basics Cookbook, The Essential Wok Cookbook and Simply Tuscan. She straightens the curled edge of one of the covers when Mr. R. appears at the door. It looks like we’re in the same hotel this time. I’m just down the hall. He looks at the stack of books on the floor. 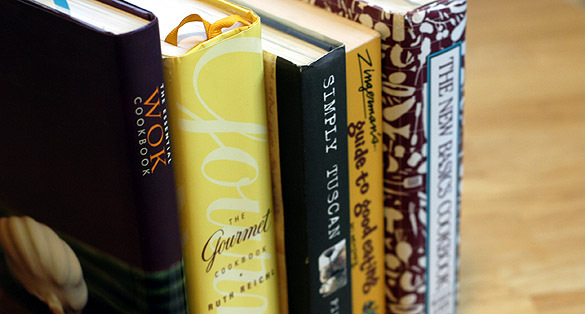 Cookbooks? You’ve been lugging books across the country? Caryn firmly places her hand on the stack. I only brought a few. These are my favorites. I have over 60 of them. Is there a bookshelf in that suitcase too? Maybe. And still I have less luggage than you. Mr. R. picks up the wok book and begins to flip through the pages. I’m in the mood for Chinese tonight. Caryn perks up and digs through the suitcase again. She pulls out a very large book with gorgeous, glossy photos titled Asian Flavors: The Beautiful Cookbook. Great. Because I just got this one! Mr. R. rolls his eyes and puts the book down. We’re leaving in five minutes for a sort of mini-production meeting on the new set. You can come too. Caryn smirks as he heads back to his room. She pulls one last book from under the clothes and examines the cover: When French Women Cook. A bookmark holds her place. I guess I’ll need something to read then. She tucks the book under her arm and sulks out. This entry was designed as a response to a popular meme about cookbooks. I was tagged by New Orleans Cuisine and Culinary Fool, so I had to throw in my two cents. I’m ashamed to admit that I really have been known to travel with more than one cookbook in the suitcase. Other people that need to join the meme? I think I’m the last person in the Land of Food Bloggers to complete this meme so I have a new suggestion! If you don’t have your own blog, use my comment section here to respond to the above 4 questions. I’d love to see what y’all read! Actually, you can tag me… amazingly, I have not been tagged yet with this meme. I knew you’d be able to work it in, somehow. Thanks for doing this! I love seeing everyone’s responses and am getting more ideas for my stash of books… Oh maybe that’s not so good! I love how you worked answering this into a scene! Great work Caryn! If you’re willing to share the information I would love to know the make and model of camera you use for your food shots. They are really incredible. You can e-mail me or post it here.